we are filling up our calendar with interesting events for 2014 (and hopefully not just in LA). so far, we have done florals, calligraphy, DIY, and blogshop. they have been selling out rather quickly, so i wanted to start a mailing list that i could notify people with before the events are announced on the blog & social media. and if you have a workshop in mind that you’re dying to take, leave us a comment below and we’ll try to make it happen. we have used for years to send out all of our blogshop updates to students & alumni, so i wanted to get one going for designlovefest too. if you don’t know about MailChimp you should definitely check them out for your business or blog. great custom designs and stats that you can track on how many people are reading your eblasts. and if you have less than 2,000 people on your list, seriously, i’m a big MailChimp fan for my businesses. sign up for the designlovefest mailing list! I would love to take a calligraphy or floral workshop! Calligraphy and florals would be great…in Denver! Any of those classes in the DFW area!!!?? Blogshop & calligraphy in Florida! Minneapolis or Des Moines Blogshop! But in the summer. Weather be crazy otherwise. Des Moines is cooler than it seems, promise. We’d love a blogshop here! Or Kansas City or Chicago. But I wouldn’t mind another trip to California this year either. Floral and calligraphy classes in NYC, please! Creative mixers for people that would like to get to know others that are in the same field they are in. do you ever have events/workshops in philly? i’d love to go to one! cincinnati is beautiful, especially in the early fall. so many good places to eat and fun things to do! I’m dying to take a Brooklyn/NYC BlogShop, but the spots go so darn fast! Hopefully, this mailing list will help me get a jump on a slot the next time you’re in town. Thanks, Bri! fingers crossed i can get into your online blogshop class. Wished I lived there, your workshops sound great! Come back to Minneapolis! I would love to do a calligraphy workshop. I really want to learn VIDEO! (And calligraphy). In LA or SF (I’m in SLO, smack dab in the middle). photography and calligraphy in austin! I would LOVE LOVE LOVE to take a calligraphy class! A calligraphy workshop in Minneapolis would be fantastic! 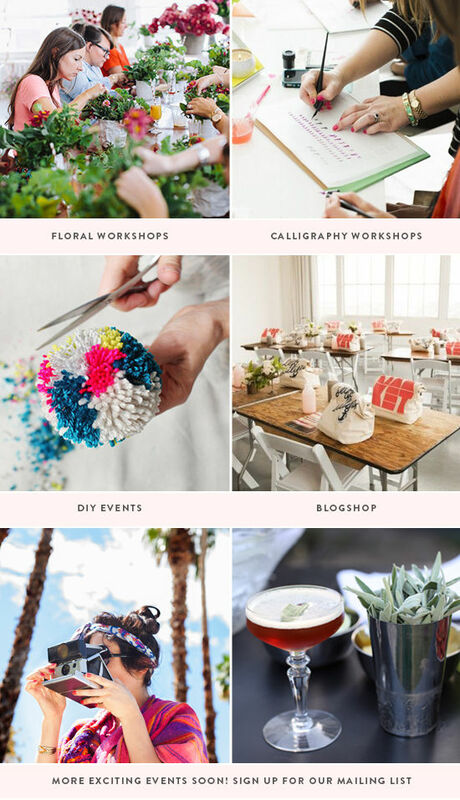 Ooo…the floral, calligraphy, and blogshop workshops are the ones I would love to come in OH…. Calligraphy!!! I didn’t check your blog for a few days and when I finally had some time to catch up on posts all the tickets were sold. I would LOVE to take a calligraphy workshop. calligraphy or floral design in chicago!!! A calligraphy workshop in Boston would be fabulous! calligraphy or floral in San Antonio or Austin, Texas! Calligraphy in LA again! Please!!! Workshops in mind: Creative Typography, Photography (tabletop photography, styling), Creative Business Skills (how to Build a Brand), Event Planning Workshop, Styling Spaces, Table-top Styling, Creative Community Mixers, etc. i would love to attend calligraphy and floral workshops in NYC! What about online classes? I’d love to take a calligraphy class but am not always able to make the drive to LA to attend a class. It’d be fun to receive all the tools via mail and follow along with you gals from home 🙂 Then we can all post our work through , , etc. gosh I hope you do another calligraphy! although I am REALLY looking forward to the floral workshop in February 🙂 yay! ANYTHING (especially calligraphy and blogshop) in Atlanta, Chattanooga, Charlotte, Nashville, Greenville SC, or Asheville! I would love to see another blogshop online – or just more online classes in general. In the perfect world we could split you up in to millions of pieces and send you all over the world to give us a hit of fresh style and creativity but since as of now in the year 2014 that is impossible, it would be wonderful to have more online courses / webcast content. p.s. Kudos on the new mailing list. I’m so happy we’ll have the chance to know what’s coming so we don’t miss out – great idea. Do you know when you are coming to sweden next? I am dying to come to your blogshop workshop! Beginner and advanced calligraphy, please! Hi! Just signed up. I love all the workshops you’ve already done…something I’d love to see is a photography styling workshop, or photography for blogging in general. I know workshops like this exist but they cost SO much money…maybe you could offer something slightly more affordable? I know you have blogshop in NYC and I would love for these other work shops to make here as well! Are you an artist! Amazing events!!! I’d love to have Calligraphy in the DFW area or anywhere in Texas really, I would definitely make the road trip for that one! Salt Lake City please! Perfect place to stop in the winter. BEST snow on earth and so many fun and unique upcoming artists! please please host a calligraphy class in seattle!! Please do another calligraphy class in LA!!!! I cannot believe all the April calligraphy classes are already full!!!! Do you ever do calligraphy workshops on weekends? I have a full-time job during the week and am dying to take one of your workshops!!!!!! I would like maybe all your workshops! but for sure the floral and calligraphy ones :). I would love to take a social media course! I am getting married over the Labor Day weekend this year and would love to attend any DIY workshop with my 2 bridesmaids for some fun and unique wedding/party accent/decor ideas! it and I have you saved to fav to look at new stuff on your blog. my phone .. I’m not even using WIFI, just 3G .. I would love a VIDEO class in SF please. In addition to calligraphy, diy and floral, I would love to take letterpress and photography (maybe a photo series, food, children/babies, weddings, nature, etc.) classes. Chicago. I would love for you to do an online social media workshop. I loved the online blogshop! Thank you for all that you do! Beginning calligraphy in Los Angeles or Orange County would be great! Any weekend classes available? I’d love a calligraphy workshop in NYC! Calligraphy workshop in NYC please! Could you do a floral class in NYC/Brooklyn, pretty please? This type of clever work and exposure! Keep up the awesome works guys I’ve incorporated you guys to our blogroll. Any chance you’re headed to the Boston area this year for a floral workshop? I’m DYING to take a weaving workshop in the LA area. So sad that I missed the one with Maryanne Moodie 🙁 It was sold out before I knew what was coming. Seattle please! The weaving class you just taught looked amazing but I would be excited about all! I’d love a Mixology class in San Francisco, please!! Please come to Toronto one day for a blogshop!! I would love to take the beginner calligraphy course and other workshops too! I live in Greenwich, CT but can go to New York City. Would love to do an Intermediate DSLR Photography course in Los Angeles (or willing to travel wherever!) …for bloggers and/or business owners who want to take their photos to the next level! Or… would love to see another workshop collaboration with Max Wagner! I would love to attend one of these. Come to sunny Florida! Or at least Savannah Georgia. There are designers in the south too! Will you be doing any more of the beginning calligraphy classes in LA soon? I would love to attend!!! Floral or calligraphy in Atlanta! Hi there, I’m an art director and I would love to take a calligraphy or floral class—looks so inspiring. I’ll travel anywhere a class is happening – a creative retreat is needed this year! Do you come to San Diego? It would be wonderful to have one in the UK! Hello from the UK! If not, I will continue to stop by to see all the beautiful creative activities going on. I really love this place. I love your artful designs and want to learn more. hi! could you try to do this kind of mailing updates for your own blogs? that would be awesome!! I so wanted to take the at home BlogShop and somehow missed the recent email for last chances. If there is a way I could still sign up for this at home class…I’d be willing to pay the full price and forego the discount price…. I know class is good only till end of December. Had to ask in case there is a possibility. But certainly understand if it’s not. Any workshops scheduled for NY? I’d love calligraphy, in particular. Come to Florida! I wanted SO badly to go to the DesignLoveFestival but tickets sold out. Have you ever heard of the school of styling? I think something like that would be the perfect balance between styling, calligraphy, floral styling and more! Love love love your blog, it has been a HUGE inspiration of mine for my side business! Hi! I am really, really interested in taking a calligraphy course – I understand you’ve sold out for your October class, when will you anticipate having another? Is there any way to get on a waiting list? I love handwriting and have taken courses up in Seattle, so would love to learn more and take it to the next level. Thank you! I’ve been obsessing over mossy green sofas lately! This one would be perfect. Also love it in the blue!